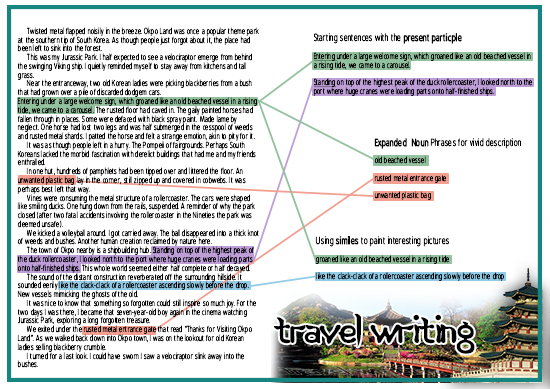 Side 1: A mentor text with 3 grammatical/structural/stylistic features highlighted. Side 2: Further examples of openings and endings. They show examples of success. This is how we want students to write. I find it much easier to show this, than just to explain or offer checklists. Through exposure to high quality examples of writing, students will be better placed to produce examples of their own. They show how to get started (and finished). Some students will mimic the structures of entire openings, stealing judiciously. Others will use the openings to just get a sense of the sort of thing you might write. In either case, I am confident this is going to have greater long-term impact than just telling them how to start. Hopefully, cries of ‘I don’t know how to start’ are a thing of the past! They isolate important features. Seeing examples of language features in context helps students to see how they work and encourage them to use them. They limit the amount of information. Literacy mats can sometimes bombard students with so much information that it is hard to know what to concentrate on. These mats focus on three main techniques, giving examples to illustrate. They needn’t take a ridiculous amount of time to produce. My colleague spent some time creating the design but we have ensured that it is very simple to create a new mat from the template. 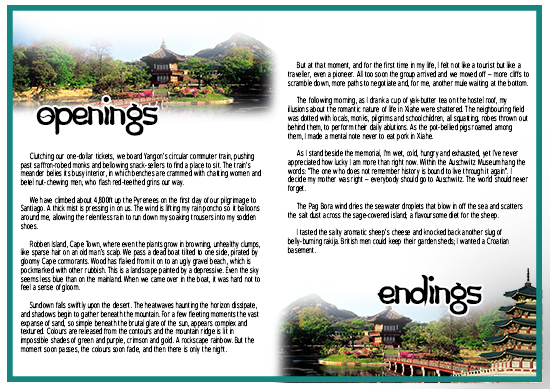 This is the pdf version of the first mentor mat: Travel Writing. As ever, feedback is welcome. I totally forgot about that! Thanks for reminding me. I fixed it but the files are in school so I’ll chase that up on Monday. A year and a bit on, how useful are you finding the mats? Are you using them differently now than you were initially? I am considering making some for my classes so would love to hear any further reflections (apologies if this is covered in another post somewhere). I’m still regularly using them, although I haven’t made many more that look as pretty as the one in the post. Even without the mats, for all pieces of writing we use mentor texts, and for most we will look at beginnings and endings. Please let me know if you do make some- I’d love to hear how it goes.